Yippie-ti-ya-home-sweet-home. 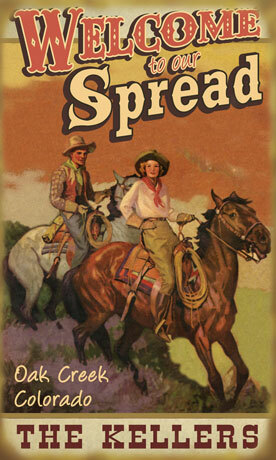 Both cowpokes and city slickers agree: a more charming welcome can't be found north, south, east or west of the Pecos. Wood plank sign. Specify location and family names, up to 30 characters and spaces each. Please allow 2-3 weeks for delivery. No rush delivery or gift box. Available in four sizes: 14"W x 24"H, 18"W x 30"H, 23"W x 39"H, 28"W x 48"H Item can only be shipped within the Continental US.